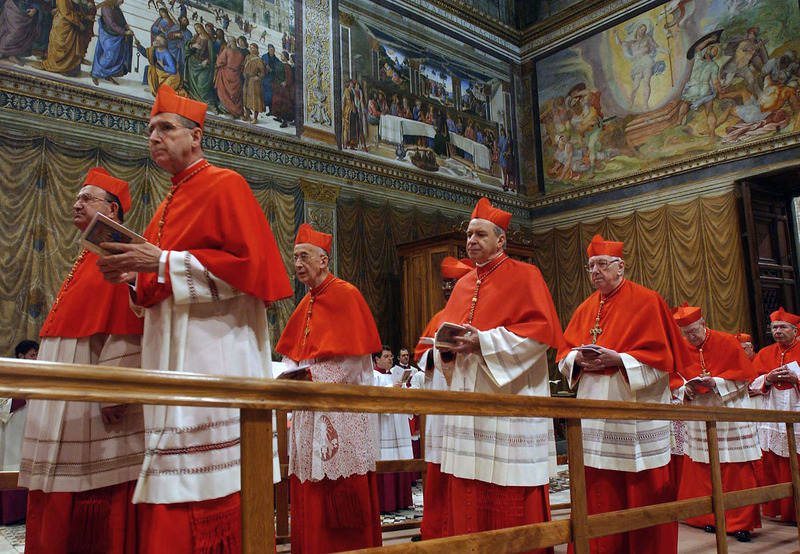 VATICAN CITY—With the date of the conclave to elect a new pope now set, cardinals from across the world have been meeting to discuss the future of the Catholic Church, a conversation which has apparently sparked interest in the possibility of also electing a new god. According to inside sources from the Vatican, the Church is "seriously considering" replacing the god that has led their faith for the past infinite amount of years. "With Pope Benedict's resignation, this is the perfect time to update our brand" explained Catholicism pundit, James Nolan, on the recent Vatican developments, "the Catholic Church is looking to be more progressive and more appealing to the younger generation... sure, a new pope could help do that, but with the way we've been going recently, we really need to make some changes higher up..."
Nolan's feelings are apparently shared with many of the cardinals voting in the upcoming papal election as the motion for a new god was reportedly brought up by a senior cardinal-bishop using the sports analogy that they needed "more than just a coaching change" and that at this point it'd probably be best "to just gut the whole thing and start the re-building process". With this, many cardinals then immediately backed the initiative, apparently saying that the more than a billion year-old God was no longer capable of properly doing his job as their supreme being, and even went as far as to blame the recent unpopularity of the Catholic Church on him and not the pope. "Since the pope is just the messenger of god, Benedict has really just been a patsy" spoke John Hardman, a catholic historian, "it wasn't really Benedict who was turning a blind eye to priests who molest children, it was this god turning a blind eye to Benedict turning a blind eye to priests who molest children." Although cardinals at the Vatican did not address the sexual abuse scandal explicitly in their meeting, the consensus did seem to be that they wanted a more active and involved god. You know, one that actually makes things happen and steps in from time to time when humanity is in trouble, instead of just watching over us and silently judging us with some secret "plan". Similarly to the papal conclave, the potential new god election has already attracted many potential candidate deities, but apparently there is still no clear front-runner. So far, the contenders have ranged from everyone from Zeus to Xenu, and although the general feeling among Catholics seems to be in favour of any younger and more visible god, there has also been some particular interest in the possibility of a non-European or even a black god. "For a long time, this god has been very biased towards Europe and North America, so I think it'd be really neat to see an African god or something for once" confessed one Catholic tourist we spoke to outside of the Vatican, "but really I'd just be happy with any god who was a little bit cooler about birth control... that'd be nice." With next week's election of not only a new pope but now possibly of a new god, hopes are high for some real changes to come to not only the Catholic Church but the world as a whole. Unfortunately, most experts are already predicting that the new god will probably just be another old man with a big white beard sitting on a cloud.